Rebeca: The Best Recipe There Ever Was. 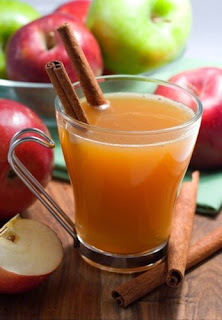 1 Gallon Of Apple Juice (100% Apple Juice) ½ Gallon Of Pineapple Juice 1 Cinnamon Stick 5 Clove Pieces ½ T. Nutmeg 1 Orange, Sliced Juice Of 1 Lemon ½ C. Sugar Combine All Ingredients In A Big Pot On The Stove And Simmer For 2-3 Hours. Or In A Large Crock Pot For 2 Hours On High, Then Turn To Low Or Keep Warm And Can Be Left On All Day.